We’ve been having some fun, and here are some photos. So. Remember how I said we’ve been setting snow-records here? I came home Monday and saw Paul. 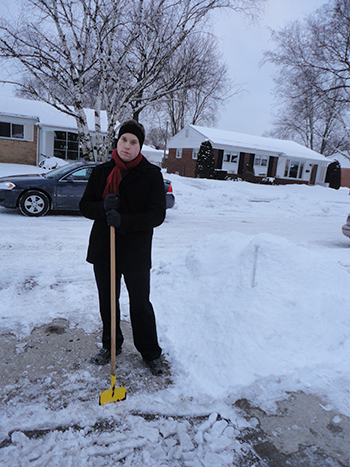 He was chipping the ice off of the driveway, which was crazy-thick and so that chore was essentially insanity from the get-go. Ta da. Yes. That snow is piled to the waist at least over there. I don’t blame him. The drive was really icy and I guess one of his hoe-things broke and everything. Well, Valentine’s day is coming up! I love Valentine’s day. It’s a lovely time to remind people that they’re special and that you care. If you would, try to give someone a kind word on Valentine’s day. So often people feel left out on that day, and it really only takes something simple to make someone smile. 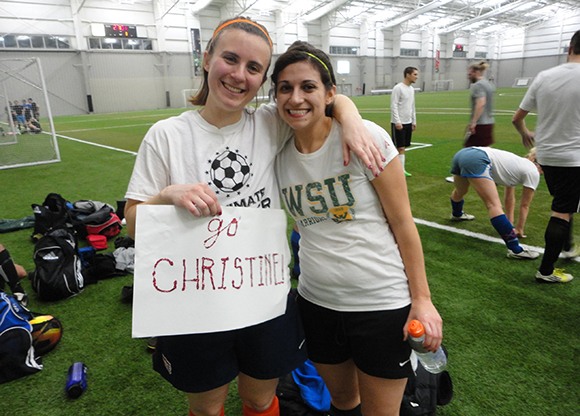 Aaaaaaand on Tuesday a bunch of us came out to watch Christine play an indoor soccer game. That sign=made by me. With glitter and love. I kind of arrived late, and everyone else was sitting on the bleachers. But I was like, “Nahhhhhhh” so I stood on the side-lines and yelled until my brothers and a gaggle of their friends came and joined me. We named the team (“Cardinals”), the opposing team (“Muskrats”) and assigned names to most of the players. Macklemore (he had a similar haircut). Lavendar (this was a heavier guy…with a curly-head-and-beard). Charles (Often yelled, “Sir Charles!” or “Charlie!”). Catalina (oh how they loved yelling her name. Slight musical qualities and what not). And we yelled and cheered every time they stole a ball and cried “waaaah!” like babies when one of the opposing team members were bad sports and ended by lifting Christine like she just won the World Cup. So, I’m going to chat with my mom and pray a rosary and sign off.